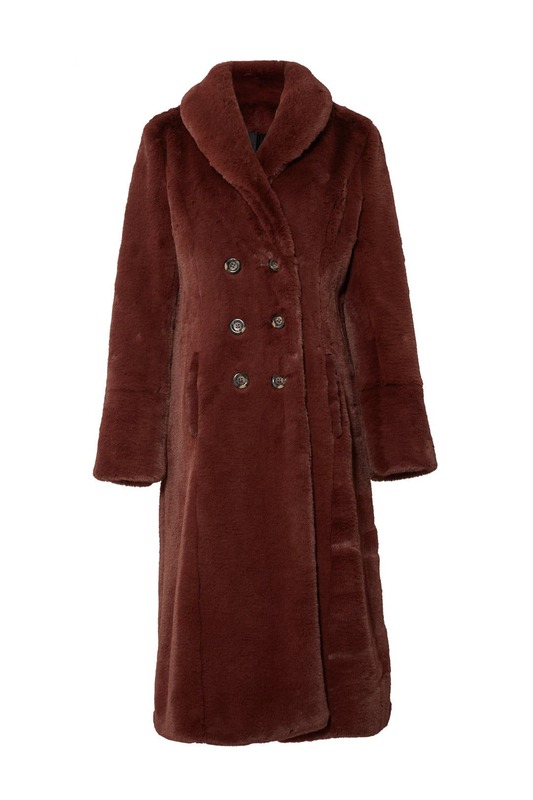 Ultra-plush faux fur and a shawl collar add glamour and warmth to this longline coat by somedays lovin. Brown faux fur (100% Acrylic). Coat. Long sleeves. Exposed front button closure. Fully lined. 46" from shoulder to hemline. Imported. This jacket was a little heavy, but so so warm!!! 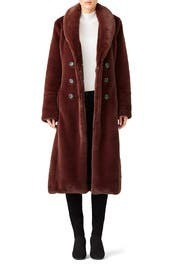 I was looking for The warmest coat rent the runway had it and I think I found it! It's long, warm, and soft. The only downfall is the buttons don't go all the way up. 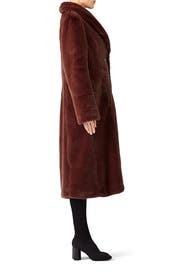 While the coat is true to size, it runs very long!!! I felt engulfed by the small at 5'10"! Perfect for this crazy cold winter we've had in New York! This coat makes me happy. This coat was such a fun rental. It's big and soft . Totally hug-worty. People kept petting me, though. Love this long coat. So warm. So soft. A must for any cold wether climate. -11 degrees Fahrenheit in Korea for the winter olympics and this jacket was perfect! I stayed warm the entire time, when all my friends were freezing. Even the ones with battery heated jackets weren't as warm as I was. Great on the airplane as a blanket as well! Super soft material. Feels so great to the touch. A bit weird when random strangers would come up and rub on me though. I'm 5'2, 135lbs, 34dd and the small fit pretty tight...but I wouldn't size up since it will probably be too bulky. Constantly receiving complements on this unreal cot. The coat is unique yet so versatile. I wear it to the office, to the club, and even when i'm running errands. 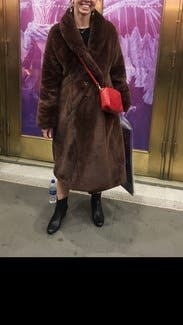 The coat is great for the cold new york weather! Extremely soft and surprisingly warm, but not very practical for everybday wear. I felt like snuffleupagus. The jacket is super heavy as well, and takes up a lot of room. This fur was amazing!!! I wish I owed it. It's soooooo heavy so, fair warning. I traveled w it and almost had to put in a separate suitcase. 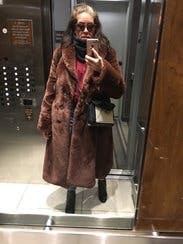 I wore it in Montreal in dead of winter and it kept me warm. Loved this coat so much!!! Not only is it beautiful and so stylish but it's ridiculously comfortable and cozy. Just too big and bulky for me. Otherwise, lovely and stylish. The fur was soooo soft & I felt like I stole the room everywhere I went. Perfect overcoat for a cold day. 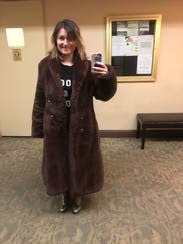 I'm 5'9" and this coat was simply too big for me, even in a size small. I felt large and not in charge. More like a giant muppet. I LOVE this coat. If I had more to wear it to , I would've purchased. It's warm and cozy. Definitely fancy and a tad heavy. This is definitely brown, warm but very bulky. 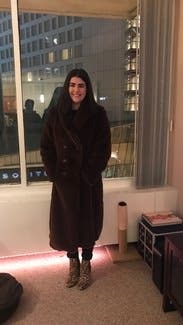 Wore this to a winter party and was warm and cozy. It was a little heavy and bulky but to regret in selecting it and would wear again. 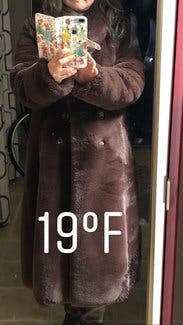 I don't care if my husband said I looked like Bear Grylls (I think he meant to say Grizzly Bear), this coat kept me warm in 19F/1F windchill weather. It's weighs ton so won't recommend it for petite person. I'm 5'3 and it came down to my ankle. Also as others said it runs big (I'm typically medium) so size it down. It might not allow you to layer a lot as the sleeves are not that roomy despite the volume but with this coat you don't need to layer. If you need to wear cocktail dress in subzero temperature this winter, rent this!! This jacket is heavy! I love it but it was a mission getting it to fit in my suit case! Rethink it! I mean this reminded me of what Leo had on in the revenant. It's basically a bearsuit and probably weighs 10lbs but it was so soft and warm and perfect for the polar vortex. And of course eyecatching in a sea of black puffers. 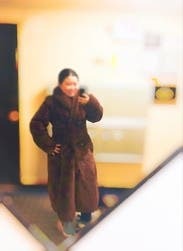 The coat is super bulky and heavy but when it comes to keeping warm this coat rocks! The wind does not permeate the material and I was toasty all night/ al day. I wanted to love this! I got the small but wanted the XS which was unavailable. 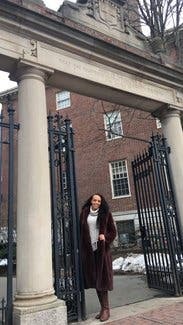 All I can say is that I felt swallowed whole by this coat. I looked like a fuzzy bear. It is warm for sure which is what I wanted for an upcoming weekend in NY. But alas it is going straight back to RTR. Wanted to love this. It's really heavy and definitely runs big. Made me look bigger than I am so wasn't able to wear it. Size down! It's really warm though. I started sweating the second I put it on. 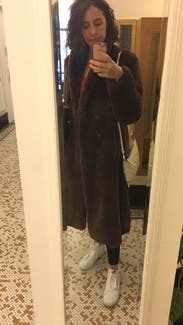 I was so excited for this coat! It's amazingly soft and warm. I never wanted to take it off! It literally feels like you're being hugged by a bear. It definitely runs really big though, so size down! Every person I walked by wearing this coat said how much they loved it, even though it was clearly too big on me. That's how awesome it is! 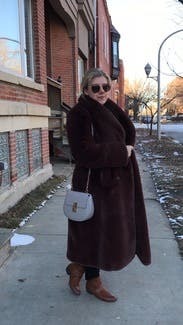 New Years in New Jersey is typically pretty cold and this year was even more frigid than usual which made me extra happy that I chose this coat when I decided that I needed/wanted a long "fur" coat to keep me warm over the holiday weekend. The small was unavailable, so I got the medium. It ran SLIGHTLY large/oversized, but I loved it like that. (Sleeves were a little long and back not super fitted) I wore it every day I had it and was super sad to return it. 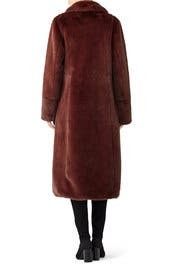 Best fancy coat to wear in any winter vortex. This jacket was gorgeous and SO warm - was just so over sized I couldn't wear it. Would be perfect for an evening - black tie type event. the material is so luxurious. This jacket could have wrapped around my body twice. The jacket is much more oversized than the picture makes it seem. I looked like a Build a Bear. It was super soft, but I just couldn't bring myself to wear this out of my house. This coat was just too big, it looked like I was wearing someone else's coat. I couldn't have gone smaller because it fit correctly in the top, but it was just wide and big. I didn't end up wearing it. It is so soft and warm though, I wish it fit! This jacket was HUGE, felt like it swallowed me up. Did not end up wearing. Also would reserve for real winter days. It was 40 degrees where I was and I would've sweated in this. Did not wear. I wanted to love it but it was just too oversized for my petite frame. 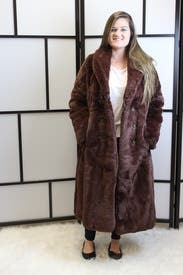 I am 5 4” approx 120 pounds and the sleeves were a few inches too long and the coat was just too big to wear. I would recommend sizing down, it may have helped if I would have tried an XS.